Brand refreshed + bold look. After adopting a new brand identity in 2010, Linfield College selected Creative Company to expand on the identity and create a refreshed, bolder student recruitment suite. High school students and their parents, high school counselors. In 2011, Linfield College chose Creative Company to write and design its 2012 - 2014 recruitment suite, building on the college’s new brand identity and “Big Six” key messages. Creative Company had already developed three award-winning student recruitment suites for Linfield between 2002 and 2008. The college was looking for a bolder, more student-friendly design—built on the new identity system—with large photographs and strong content. The new suite also needed to fit within a limited budget. Creative Company first expanded the new brand identity system by broadening the color palette and introducing bolder versions of the brand fonts. We then planned, designed and delivered a refreshed brand in a mixture of formats for the student recruitment suite, including magazines, posters, postcards, guidebooks, and “roll-fold” self-mailers. A consistent design system unifies all materials. Each piece showcases the college’s academic strengths, collaborative community, remarkable campus and other unique assets through high-impact photographs, quotes from students and alumni, an “at-a-glance” infographic, dynamic layouts and strong messaging. By producing web-printed magazines—rather than standard brochures—we significantly reduced printing costs and created materials with a more personal interaction. The magazines provide more space to build Linfield’s story, while focusing on specific experiences—faculty research and honors, study abroad opportunities, the Oregon lifestyle, dorm life and a range of alumni careers. 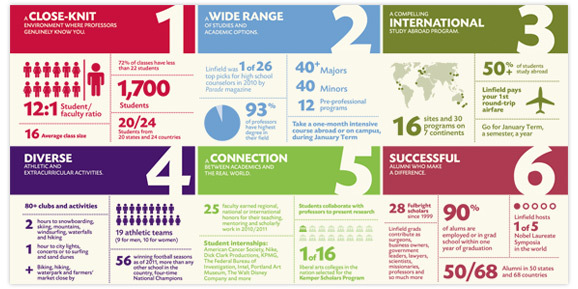 An eye-catching infographic of Linfield’s “Big Six” is a central brand element throughout most publications. Statistics and facts are incorporated as graphic elements for at-a-glance reading. They bring focus to critical details about the school’s size, activities, majors/minors, faculty and programs. The High School Visit Poster earned a Merit Award in the 28th Annual Educational Advertising Awards sponsored by Higher Education Marketing Report. 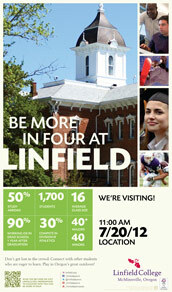 Linfield staff and leadership welcomed the brand refresh and entire student recruitment suite. [Creative Company has] a great understanding of the Northwest perspective and the personality of Linfield. Their insight into current marketing trends, tactics and channels keeps us thinking ahead to what will be most effective in reaching the right students. Working with Creative Company incorporates both the strategic leadership and energy I enjoy when planning our marketing efforts and publications. Each and every meeting is productive and fun; I always look forward to where our conversations will take us.